Although we think of Cranberry Sauce as a traditional Thanksgiving recipe, cranberries add a sweet tang to any dish… they’re not just for Thanksgiving! 1. Wash cranberries. Remove bruised berries and stems. Drain. 2. Combine all ingredients in large saucepan. Cover. Simmer for 10- 15 minutes until berries open. Stir. 3. Remove from heat and cool. Put sauce in container and refrigerate until chilled. 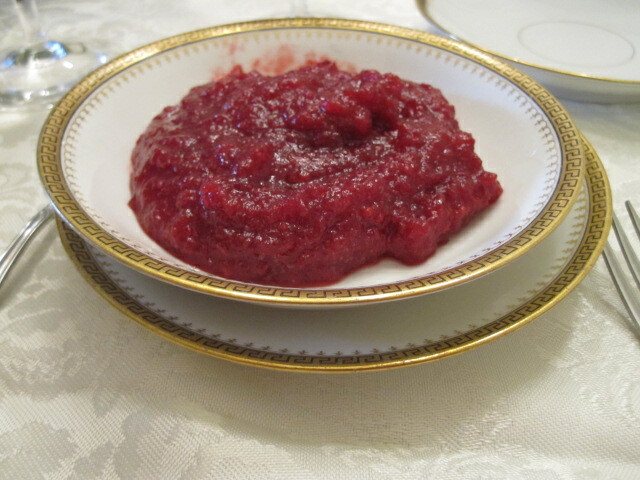 Let us know what you think of this easy vegan recipe: Cranberry Sauce! not crazy about all the sugar it requires when cooking with cranberries……. is there an equivelent measurement for stevia or agave ? ?